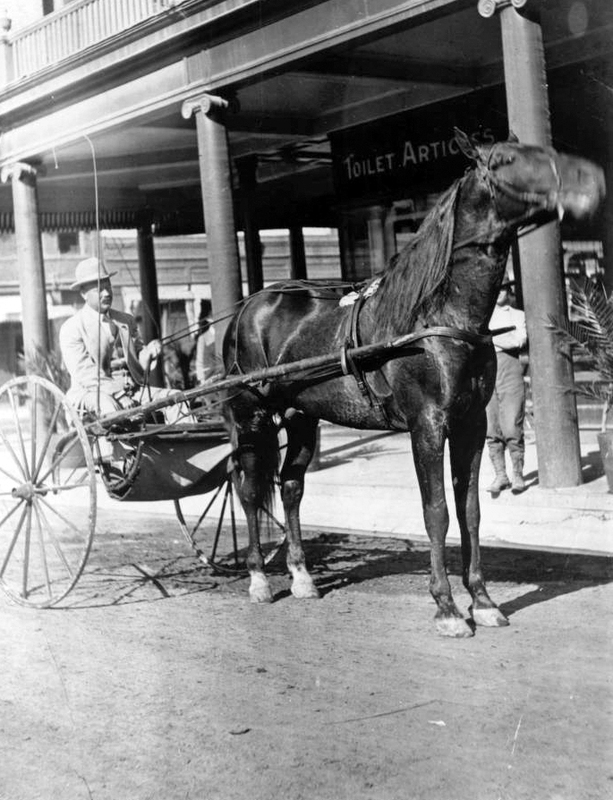 Part of the success of territorial Phoenix was its extensive public transportation system. That is, trolley cars. If you lived in Phoenix anytime after the mid twentieth century, it would probably surprise you to find that underneath the streets crowded with cars are the old trolley lines, dating back to the 1800s. 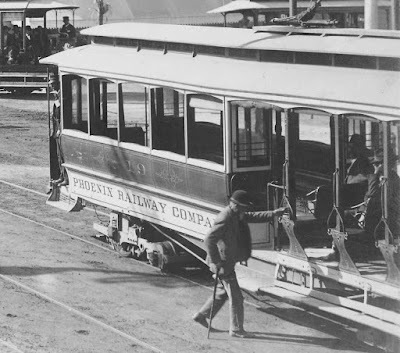 When the light rail in Phoenix began just a few years ago, while it may not have exactly followed the routes of the old trolley cars, but it followed the tradition. And if you've ridden on the light rail, you know that it's great, but there are things missing. But don't blame the light rail! One of things that is missing nowadays is the infrastructure that made using public transportation the first thing that people thought of when they needed to do something, like shopping. I have to admit that when I pondered the problem of trying to carry groceries, or bags of stuff from Walmart, on a public transportation system, I was puzzled. The answer, of course, is delivery. When Mrs. Shirley Christy went shopping at the local store, assuming her husband was using the horse cart (that's him there next to the Adams Hotel at Central and Adams), she could walk over to the store, or take a trolley, pick out exactly what she needed, and go home empty-handed, carrying nothing. The store delivered to their house, for free. Of course, with the invention of the horseless carriage (automobiles), offering delivery no longer made sense. And so, very quickly, businesses became "cash and carry" - which just meant that you paid for your stuff right then and there, and carried it away in your automobile. If you didn't have an automobile, well, the new system just didn't work for you. Bringing the old-fashioned idea of delivery into modern day, just think of ordering things online. Personally, I order a lot of stuff online. I click, and it gets delivered. Mostly it's routine stuff that I really don't need to see in real life, like vitamins, or dental floss. And just like the old days, delivery is free. As of this writing, I can't think of any store along the light rail line in Phoenix that would allow me to go in, pick out what I wanted, and have it delivered to me for free. It sounds like a crazy idea, but if you ran a business along the old Phoenix trolley line, that's what you did.